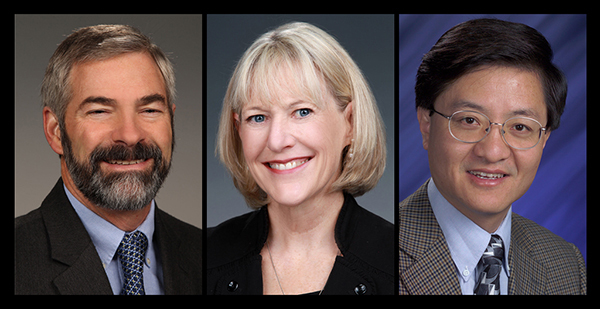 Jim De Yoreo, Janet Jansson, and Yong Wang were selected to join the Washington State Academy of Sciences. Three scientists at DOE's Pacific Northwest National Laboratory have been selected to join the Washington State Academy of Sciences. Jim De Yoreo, Janet Jansson and Yong Wang will join other scientists and engineers from across the state being recognized for outstanding scientific achievement and leadership. Academy members provide expert scientific and engineering analysis to inform public policy-making, and work to increase the role and visibility of science in Washington state. The academy was created in 2005 and including the class of 2015, consists of 245 members from diverse academic disciplines and industries, including aerospace, agriculture, computer, science, energy, engineering, ecology, and transportation. The three new inductees bring PNNL's total number of current staff who are members to 13. In addition, the academy's current past-president and president-elect are both retired PNNL researchers. The academy elected 24 new members this year. They will be honored at the academy's annual meeting in Seattle in September. Jim De Yoreo. De Yoreo is the chief scientist for the Materials Synthesis and Simulation Across Scales Initiative at PNNL and is also an affiliate professor of both chemistry and materials science and engineering at the University of Washington. He was recognized for "pioneering research that advanced the fundamental understanding of the molecular-level mechanisms of biomineralization, and translated those principles into realizable materials technologies; and for his leadership in the materials sciences research community." He is a Fellow of the American Physical Society and the recipient of both the Laudise Prize of the International Organization for Crystal Growth and the American Association for Crystal Growth's top award. Janet Jansson. Jansson is the division director for biological sciences at PNNL. She was recognized for "significant contributions in microbial ecology, including applications ... to understand complex microbial communities and advance understanding of how microbiomes are affected by external factors such as climate change and environmental exposure." She is a Fellow of the American Academy of Microbiology and president of the International Society for Microbiology. Yong Wang. Wang is a Laboratory Fellow and the associate director of the Institute for Integrated Catalysis at PNNL. He also holds a joint appointment as the endowed Voiland Distinguished Professor in Chemical Engineering at Washington State University. He was recognized for "groundbreaking research that ties fundamental kinetics studies of catalytic materials to the creative design and successful commercialization of novel microchannel reactors." He is a Fellow of the American Institute of Chemical Engineers, the American Chemical Society, the Royal Society of Chemistry, and the American Association for the Advancement of Science.